A Week Long Date With Perumal! 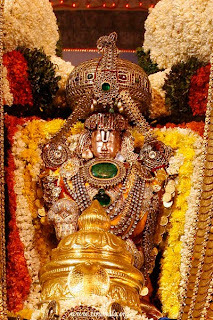 September is special in Tirupathi. Brahma of events. Brahmotsavam. We (me, dad, gran) went on a trip to Tirupathi and Tiruvallikeni with brief visits to Perumals at other places. The bus started from Ramakrishna Mills at about 6:30 on Sunday, 12th Sep'10. The bus stopped at palladam lakshmi mills to pick some people and also have dinner at one of the houses there. Since most of the people who were on the trip were "bhagavadhaas" we did not eat out at all. We went to some houses along the way for bhajans and they provided food. At Tirupathi we ate at the madam. The bus stopped at a place called Veeranguppam Gramam, Paeranambattu Ondriyam, Ambur. The name itself says a lot. No toilets or bathrooms. Had to use the open fields. The men took bath out in the open and the Ladies took bath inside a small house. The bathroom was 'common'. Thank goodness I had some experience with the open feild and common bath during my childhood, or I would have screamed in terror. Since Gran came along, she made us wear Naamam. After bhajans at the perumal temple and Mohan's house followed by breakfast. We took the golden quadrilateral road (chennai-b'lore highway) on the way to tirupathi. The driver was kinda inexperienced so we made a lot of U-turns on the way. The first stop was at Srinivasa Mangapuram, perumal is called Kalyana Venkateshwarar, because he gets married daily. We took out all the Godugu to pray at the temple. By the time I came out after praying, the bhajans had started. I was not very happy about the tour until I saw them dancing and singing along the bhajans. I am not a dancer I dont experiment dancing very often. But technically what they were doing was not complicated so I joined them. It was time for lunch and we ate kovil prasadam for lunch. We had to protect ourselves from the Anjaneyars there. The TTD (Tirupathi Tirumala Devasthanams) takes good care of these temples. They maintain these places so well, you wont retch at the sight of the restrooms. We started to Alamelu Mangapuram to worship Padmavati Thaayar. The legend says you must visit Thaayar before you see Appa, because mothers always pamper the kid and a mom's child always gets what it wants from dad. We had a quick darshan, which meant that there wasnt much of a crowd for this brahmotsavam. After this me, dad, gran and some other ladies had planned to go to tirumala leaving the bhajan group behind, but dad and me stayed back with them while gran and others left to the hills. There were a lot of ganesha processions going around. We started from mangapuram to the balaji bus stand in Alipiri. We stayed at the free math in the bus stand. The idea of staying in a big hall actually made me uncomfortable, but when we landed there it all came to me, the NSS camp! It was exactly like the camp. All the bus travel had taken its toll, I slept like a log. Must say, there arent any decent hotels to eat in alipiri. We ate the food we had packed from home. Puliyodhare, Chappathi, Thayir sadham. Dad woke me up at 2:30 in the morning. Had to take bath early to beat the crowd. Everybody were all packed and ready to go by about 6 in the morning. 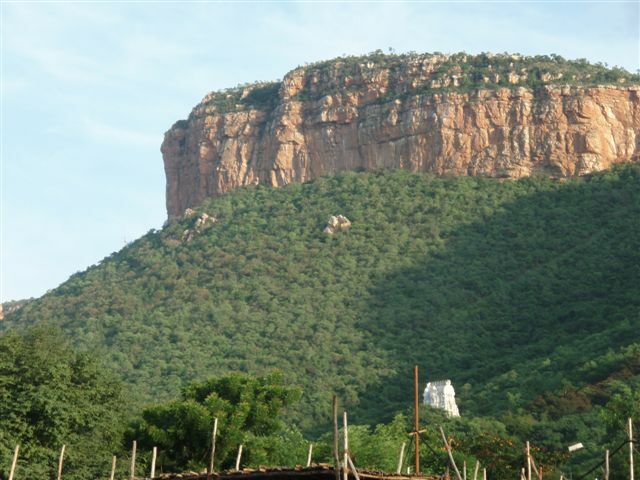 We took a Jeep to tirumala. Tirumala is a smoke, alcohol, open-urination free zone. You'll be fined if you broke these rules. At the check post, every bag is scanned and every person is checked. The vehicles are checked too. That is when i understood why the driver pushed two packs of cigars deeeeeeep into the dash board, it might have ended up falling into the engine if it had been pushed a little more. Number of passengers in a jeep is limited to 8. But we were 9 in number, that meant a 100 bucks extra for the driver (well, its illegal). We were dropped at the Ahobila Madam, where we were supposed to stay the next two nights. We had breakfast at the math, started to the temple for our 10:00AM darshan. Kumbida pona dheivam kurukkae vandha madhiri - this old saying came true literally that day, we reached the west maada veedhi in time to see the procession. It was Kalpaviruksham. Had some tough time finding the entry point to the 50 bucks queue. We had to surrender the cell phone and then go in. If I'm right, you have to undergo three more security checks on the way. No water bottles. Girls must wear chunni if they are in a salwar or even skirts. Must not wear flowers. Men should not wear t-shirts(?). It took us nearly 4 hours to get a "glimpse" of Venkateshwarar. That day the dharma darshan (free of cost) queue moved faster than the 50 bucks queue. Also the darshan was from a distance, not at the thalai vaasal. After theertham, sattari, a visit to the hundi and prasadam, we found gran talking to some people. We had lost her the previous evening. I later learnt that one of the ladies was a periyamma and one more was an athamma to me. Gawd! the old lady had relatives all over the place. Gran was staying at the Karnataka Kalyana Mandapam and insisted i stay with her. So i moved into the Karnataka with gran and dad stayed at ahobila with the bhajan group. Later in the evening me and gran went shopping after praying at the anjaneyar temple. OMG! Soooo Many bangles. Beauty! Anybody who likes bangles is bound to get a heart attack because of excitement. 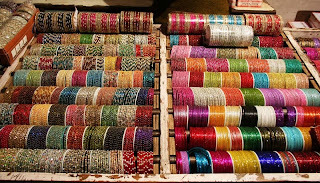 I ended up buying more than half a dozen dozens of bangles! We took the free bus back to the mandapam. That night, I went on to show harathi to the urchavar (is this sentence right? :-o). You get to see him close by. Back to sleep. D-Day. Day of the garuda sevai. Since we had nothing to do all day until the garuda sevai i managed to sleep a little more with 5-minute-sleep-requests to gran. Even then i felt sleep deprived. We worshiped Hayagreevar and Radha-Krishna that morning. After watching the morning's procession we went to visit my periappa staying in one of the maths. After lunch we proceeded to go reserve a 'seat' in the steps that lead to the west maada veedhi. Now that you have got yourself a 'seat' all you do is sit and while away some time. The times you spend sitting around doing nothing can be best spent listening to stories that gran says, watching people, learning some tricks from the lady who sweeps, .... And besides all this i used this time to read the novel titled 'The Select'. We reserved the seat at 2 in the afternoon. Around 5 in the evening the crowd starts building, and if you leave your seat unguarded, it would have been taken by the time you come back from dinner or even the loo. The procession started at around 9:00PM. The people performing in the procession were all dressed their best for the occasion. When the deity made a turn toward the west maada street, the crowd started to go mad! Instructions say that people are not supposed to throw coins/salt/pepper at the deity. But if nobody had thrown anything, I would have had a doubt if I was in India. The Urchavar was dresses in 'gold'. I still dont get the hang of it. You get to see him for may be few seconds, but people manage to figure out what type and how many jewels he is wearing. All that I was able to make out was that he was wearing a lot of jewels. Something must be wrong in me! After the procession crossed us we went to sleep. Started out early. We went to the pushkarani and varahaswami temple before we went for our darshan. It was inverse of tuesday, 50 bucks queue, well there wasnt much of a queue, moved so fast. And we had the darshan at the thalai vaasal. We were out in under an hour. After theertham, sattari, prasadham, we went back to the mandapam to get ready and pack. We decided to start back to tirupathi after that morning's procession. After making a deal with the jeep wala, we started back to tirupathi. We went out in search of a hotel to eat. We came across the ISKCON Lotus Radha-Krishna temple on the way and decided to go in. Krishna was as cute as always. There was a vegetarian hotel in the temple complex, we had our lunch from there. We started from Tirupathi at about 3:00PM in the same bus we came in. We rejoined with the bhajan group. We took the renigunta-some places I slept through-tiruvallur-chennai route. We stopped at Pachaivaarana erumal sannidhi and a house for bhajans and dinner at Nazaretpet. The bhajan at Nazaratpet house was very good. I got the chance to dance one more time. It was 11:45PM by the time we settled down at the math in Tiruvallikeni. Woke up early to take bath before anyone else. Went to the temple by walk. It was just 5 minutes away. Had a divya darshan that morning. We gave two godugus to the temple. After breakfast we went on a maada veedhi ulaa along with the godugu which was followed by another darshan. We were offered the infamous sakkara pongal from the parthasarathy kovil. It gives real meaning to the line in thiruppavai "paal soru mooda nei peidhu muzhangai vazhivaarak koodiyirundhu kulirndhu". I'm not a big scholar in tamil, but i'll my level best: Andal sings that she will offer him food that is covered in ghee, so that when you eat it by hand the ghee flows until your elbows. It did. After lunch we started from the math. And surprise! We are going to the beach! Some part of me always feels liberated whenever i see the ocean. May be its the logical part of me, because I got whipped for trying to rescue the chunni that went off with the waves by myself. We started back home at 4:12PM and reached at 5:15AM. We made few stops on the way. Return journey was fun. After so many years I spent some time with gran. It was a very good feeling sitting with her and listening to all the stories she is telling me. One thing about her baffled me.. She manages to remember so many people! their names, their family and how she is related to them! At many occasions I was wishing that I could tweet. One such instant was when I saw a guy reading a telugu news paper and it had the picture of Rajinikanth and Aishwarya Rai. When I started from here I did not love the idea of travel. I was thinking how am i going to spend a whole week? But it turned out well. I had my own dose of fun. Acquainted some new people. Saw new places. Had some peculiar experiences. And slept like a baby with swollen foot the day we came back. Wow kums .. guess u had quite an enlighting experience :) india is truly a place of depth .. btw great snaps besides the article :) !! @suresh: hehe indha maari matter lam fine print la thaan na podanum. @keerthi: yeah i did. I hope you miss india. Hi. i really like your blog. i never heard anythinginfamous' abt it. @gd na: enaku therila na.. :( @InLoveWithKrishna: may be you are from chennai? because most of the time we dont know about things that are with us.. well everybody said so.. all of them were talking about its specialty!